After a humbling season at the plate, Javier Baez and the Cubs are switching up their plan of attack on offense. MESA, Ariz.—When Cubs second baseman Javier Baez took his cuts against new teammate Jon Lester in live batting practice last Friday, something very big was missing. Baez hit without his pronounced leg kick, when he lifts his front knee about waist high. Instead, Baez simply lifted his left heel off the ground, balanced on his forefoot, then put the foot back down as he brought the bat through the zone. It was a clean, simple movement reminiscent of Albert Pujols. What was going on with one of the most ferocious swingers in baseball? Baez is beginning to understand that he can't consistently hit big league pitching with the violent hack that helped him get to the majors. Baez swung the bat last year like a man trying to win an oversized stuffed animal at one of those hit-bell-win-prize carnival games. He did smash 32 home runs between the minors and majors last year, but he also struck out 225 times. Properly humbled by struggling for the first time, Baez, 22, showed up at camp this year with a new body – he lost 25 pounds, thanks in part to dental work that made eating difficult – and a new approach to hitting. Well, not a new full-time approach, but at least now he has an honest-to-goodness two-strike approach designed to cut down on his big swing a bit. "I feel good about it," he said, "but let's see. The games are little different." Baez intends to use the modified movements only occasionally, such as with two strikes or sometimes with runners in scoring position. Otherwise, he will continue to use the big leg kick and massive swing, in which his left leg, hands and barrel of the bat traverse long distances. Indeed, Baez went right back to his big swing once coaches started throwing BP with their 55-mph heaters. What is happening here at Cubs camp is what is happening in every camp around baseball: hitters are searching for ways to put the ball in play more often. The biggest problem facing baseball today is not the length or pace of games – it's pace of action, which is suffering because pitching has advanced faster and better than hitting. The ball isn't put into play frequently enough, and that includes not just the number of pitches before we see in-play contact but also the amount of time. To address this problem, some people have floated the idea of shrinking the strike zone. It sounds good, but that idea has little to do with the reasons why hitting is suffering. Umpires are calling fewer strikes. The percentage of strikes that are called has gone down four of the past five years. And the decline in offense is not because hitters are worse at hitting strikes. Contact on pitches in the zone has remained virtually unchanged over the past eight seasons – in the narrow range between 87.3 and 88 percent. Here's where the game has changed drastically: Hitters are swinging at more and more pitches out of the zone (the percentage has gone up steadily since PitchF/X debuted in 2007, from 25 percent to 31.3 percent last year) and making contact less and less often when they do chase (the contact rate on such pitches has gone down every year but one since 2007). Translation: pitchers are better at fooling hitters with pure stuff – stuff that appears to be in the zone but isn't. Teams with hitters with short swings and who use the whole field have an edge in today's game. The Cardinals, Giants, Pirates and Royals are examples of teams that have been at the forefront of this counter-adjustment to the increase in pure stuff they see from pitchers. The Cubs are one of the teams lagging. Despite their tremendous raw talent, they are going nowhere until their hitters make more consistent contact. Only the Astros and Braves were worse than Chicago last year at making contact (as measured by percentage of all swings) and no team struck out in a greater percentage of its plate appearances (24.2) than Chicago. You may think strikeouts don't matter, that they are just another way of making an out, but tell that to the nine teams last year with the greatest strikeout percentage. All nine of them had losing records. Cubs manager Joe Maddon wasn't around for those whiffs in Chicago; he was running a Tampa Bay team that struck out in the lowest percentage of its plate appearances except for Kansas City and Oakland. But Maddon knows the ugly numbers from the 2014 Cubs. So he introduced a unique drill this spring designed to improve contact by getting the barrel of the bat quicker to the baseball. Maddon set up a pitching machine about halfway to the plate and fired pitches at 63 mph – simulating about a 95 mph fastball. But instead of using regulation baseballs, Maddon used smaller baseballs – about three-quarter sized baseballs that are small enough to squeeze through the holes in normal batting-cage netting. And instead of having his hitters use normal bats, Maddon had them swing bats that were four to six ounces heavier than they typically use. To hit a baseball that small traveling that fast with a barrel that heavy, a hitter must simply drop the head of the bat on the ball efficiently. If the barrel drops, or "casts," because of the heavier weight the hitter gets instant feedback from the inefficient path. Baez stands as a proxy not just for the Cubs, but this era of the ever-increasing strikeout rates. If he can adjust his approach and put the ball in play more often he can be a star. If he can't, he will have to go back to the minors, and contact hitter Tommy LaStella will take his place. "In high school I hit like this," said Baez, who was born in Puerto Rico but attended high school in Jacksonville, Fla., of eliminating the leg kick. "This is what I do so I don't have that big swing. We're on the same page with this, me and the Cubs. So far I feel good. But it's early right now." Baez has two major flaws to address: First, he length of his swing makes him vulnerable to high fastballs, and second, he is especially poor at pitch recognition. Those flaws are particularly exposed when he gets behind in counts, when anxiety creeps in for a hitter and when pitchers have the luxury of throwing outside the zone with any pitch. But when you dive into the numbers you can see how overmatched Baez was without a two-strike approach. In at-bats decided on 1-and-2 or 0-and-2 pitches, Baez was 0-for-68 with 55 strikeouts. In all counts with two strikes he batted .097, and in all counts when he was behind he batted .064. To his credit, Baez knows he must change. His new fitness is another sign of professional maturity, even if the weight loss was prompted by dental work over the winter. 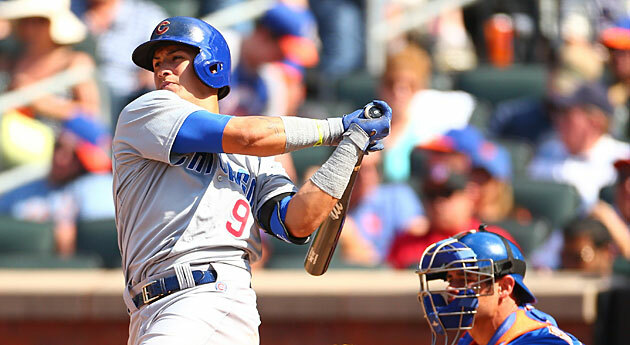 The Cubs' staff has been impressed with Baez's work ethic, speed and agility in camp. "I feel I haven't lost any power," Baez said. "I'm driving the ball everywhere." Asked if he wanted to keep the weight off, Baez said, "I'll probably add some weight, probably about five pounds. I couldn't eat for a while because of my teeth. Usually, I eat anything and everything – except salad. I mean, I'll eat it if there's nothing else, but I don't like the feeling in my mouth from it." Baez is a work in progress. Even his "natural" swing needs work. As Baez was taking batting practice off a coach one day, Maddon suggested a change in his swing. Baez hits with a pronounced "tip" of the bat in his loading phase. As his front knee comes up and down, Baez lifts his back elbow extremely high and tips the barrel of the bat behind his head and toward the pitcher. Gary Sheffield and Japanese great Sadaharu Oh also hit with this extreme tipping of the bat. But there is one major difference: Sheffield and Oh kept the hands and bat in front of their head while tipping it. Baez keeps his hands and bat behind his head while tipping it. ​Maddon suggested to Baez to try hitting with his hands and bat in front of his head while tipping. The idea was to get the barrel on its swing plane earlier. His hands and bat need to get in front of him anyway, so why not start there? It's highly unusual to see such a drastic change made on the fly on the field during major league batting practice, but Baez gave it a try. Of his next five swings, four resulted in home runs. The only one that didn't go out smashed high against a 40-foot tall fence in centerfield. But in his next round hitting with Maddon's suggestion, Baez hit none out and hit too many balls with strong hooking action to them – a ball flight no hitter wants to see. Baez is only 22 years old, athletic and may have the best bat speed of any hitter since Sheffield. He has the talent to become a major star. But it's going to take time. One round of BP, even one spring training, isn't enough to see if Baez can consistently hit major league pitching. But he at least has taken the first step so many hitters need to make in a game dominated by great pitching: he is willing to change.